* * Updated to Version 3. 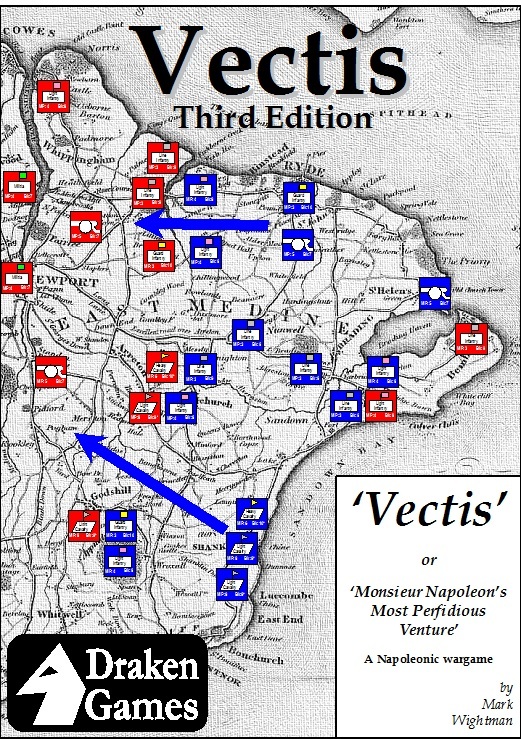 A boardgame allowing two players to fight out a fictional campaign from the Napoleonic Wars: a French invasion of England's Isle of Wight. Full rules are provided, with period illustrations and fictional vignettes conveying the feel of the game setting. Provided with the cut-outs needed to make the four-part A2 board and 93 playing counters. A game should last 90 minutes on a first play, reducing to an hour once familiar with the rules. Contains: Rules (with Background and an example game) 4 Piece 8.5"x11" map 93 counters Following reviews of the First Edition, this Second Edition features improved designs for the playing counters. Kim Meints 10 9 10 A interesting Alternate History subject. so far it's a nice game. MIchael Barlow 7 6 7 Fun game, solos nicely, plays in an hour, and very replayable. The map is okay, the counters are poor, the rulebook is excellent. Michael Socey 6 6 6 In effect, Napoleon at the invasion of Sicily. Not bad if you can suspend believe. Counters could've been better. Read through all the rules. Rules are hidden in turn play-through summery. JOSE DINIZ 7 7 7 a singular subject ! excellent !